It was my turn at MOD for my mother’s group and I made them my Pina Colada Cake, but I still had to bring something for the kids. We want their snacks to be healthy, but I also want them to be a little fun and sweet at the same time. So I decided to make an upside down pineapple muffin. Now the idea of an upside down pineapple muffin may raise a few eyebrows. You can’t make the muffins exactly like the cake, otherwise you would end up with some messy muffin bottoms (which I almost did and thankfully remembered in time). The trick is to remember that the pineapple topping is suppose to be on top and not the bottom. I fixed this problem the easiest way I could. Instead of putting the topping in the bottom of the pan, thus before the batter, I changed the sequence around. I sprayed the muffin pan with cooking spray and then added the batter. 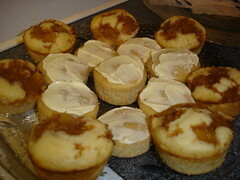 Then, I mixed the brown sugar and pineapple together and put a spoonful on top of each muffin; and then baked it. The idea was that the muffins would come out like the cake. As it turns out, what I wanted and what happened were two different things. While having the pineapple mixture on top did work, Jesse made the comment that if you bite into a part that didn’t have any of the pineapple on it, then it was kind of bland in comparison. He made sure to say that it wasn’t bad, but it didn’t have that same…something…that the bites with pineapple had. Does that make sense? So I just throw the rest of the pineapple mixture into the batter and made the muffins that way. There’ll still be that upside down pineapple taste, but they’ll just be a little simpler than the cake. In a medium mixing bowl, stir together flour, granulated sugar, brown sugar and baking powder. Add milk, the 1/2 cup butter or margarine, egg, pineapple (for an added taste, you can include a little of the pineapple juice to the batter, but I wouldn’t add more than 2-3 tbsp), and vanilla. Beat with an electric mixer on low speed till combined. Beat on medium speed for 1 minute. Spoon batter evenly into prepared muffin pans. Bake in a oven for 25 minutes or til a wooden toothpick comes out clean. Cool on a wire rack for 5 minutes.